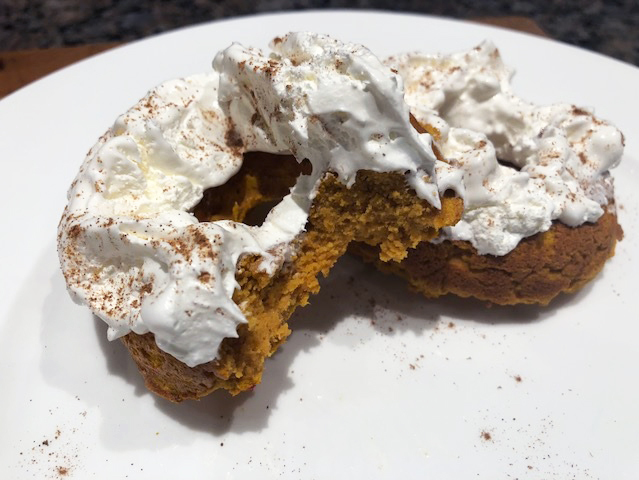 This treat is a great way to tackle that pumpkin spice craving and satisfy your sweet tooth. If you’re a donut fan, but you’re hesitant to eat them because of their high sugar content then you’ll love these! These donuts are delicious and guilt-free! The best part about them is they’re super high in protein and they stay doughy. Pumpkin is one of my favorite foods and flavours to bake with because it tastes and bakes amazing! In a large bowl, blend all wet ingredients together with hand mixer. Fold in dry ingredients. Mixture will be on the thicker side (this is normal). Next, pre spray donut tins and then scoop out mixture and form into the tins. Bake at 350° for 20-25 mins or until golden brown. Let cool before icing and top with a sprinkle of cinnamon. Enjoy!